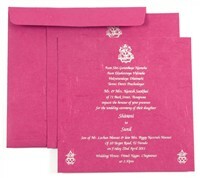 D-765, Pink Color, Handmade Paper, Hindu Cards. 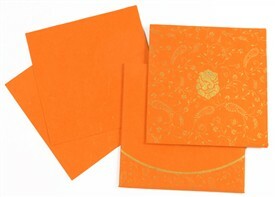 A Low Quantity Order Card: It means BULK ORDER can be placed in quantity as low as 10 cards and then in multiples of 5. 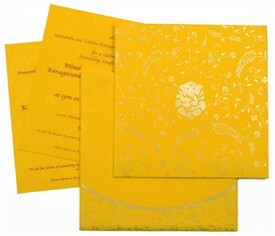 The front of this card has a floral base design in silver with an embossed image of Ganesh ji having a kundan tilak. The docket has a similar base. 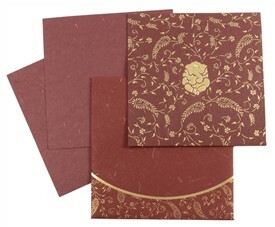 The inserts are plain and the envelope has a bottom strip border design similar to the front’s base. 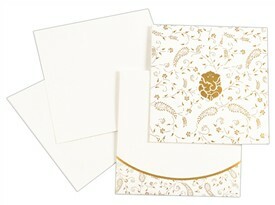 Change Paper for Card, Envelope & Inserts. Yes 100.00 US$ FREE Digital proofs free. 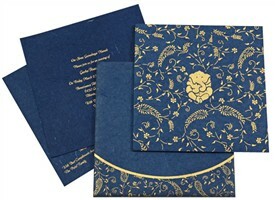 Paper swatch can be sent on cost @ 10.00 US$ including shipping cost. If printed sample is required in new paper, it will cost 75.00 US$ for one sample. Change size for full order. Yes 250.00 US$ 250.00 US$ Charges include cost for new die's, design in new size, new screens, even paper change (if required) and custom production. Change Insert Paper only. Yes 50.00 US$ for two inserts. FREE Digital proofs free. Additional cost for new production. Change Pasted Logo (if already there) Yes Free of Charge. Free of Charge. Pasted logo/symbol or initials can be changed. Digital proofs are Free. Change Printed Logo (if already there) Yes Free of Charge. Free of Charge. Printed logo if there can be changed to another logo. Digital proofs are Free for new logo. No FAQ’s related to this card. 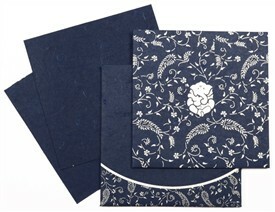 Get to see physical samples and decide on final order or feel free to order more samples. 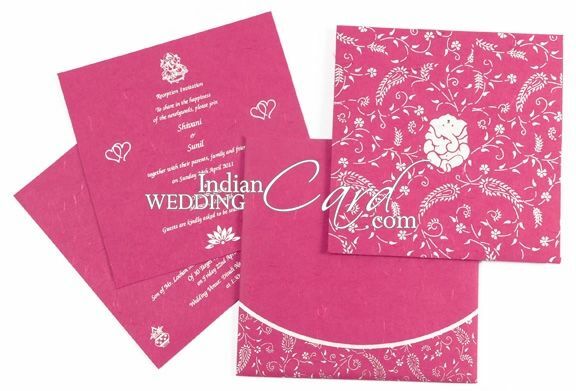 If you like a sample, proceed with placing a bulk order (online) or email order to sales@indianweddingcard.com Send Wordings with order or over email. Digital proofs are sent for checking. Make amendments as required and approve proofs for final printing. Order printed and delivered at your doorstep in stipulated time. Well packed, well printed and as perfect as you wanted.